The data science team and I at Gong.io analyzed 67,149 SaaS sales demos to understand the anatomy of demos that close deals. It took us 10 weeks of painstaking analysis to do it. Every sales demo recording included in this study was conducted on screen sharing platforms like Zoom and GoToMeeting, where they were recorded with speaker separation. The recordings were then transcribed from speech to text and analyzed against their sales outcomes (in the CRM) using our machine learning engine to identify common patterns of successful (and unsuccessful) demos. Data can’t answer every question about sales demo effectiveness, and every sales organization is likely to have a different demo process. 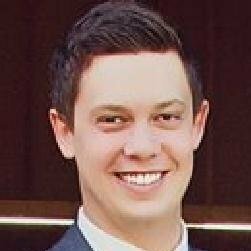 But that didn’t stop us from finding common patterns that span almost all sales demos that eventually lead to a closed deal. Be careful with the conclusion you draw here. It’s unlikely that effective sales demos involve reps plowing through every feature their platform offers. More likely, the demo is so targeted and resonant it stimulates a robust conversation -- making the call last longer. Later in this article, I’ll present data that supports this hypothesis. Don’t do long demos for the sake of long demos; make them so crisp and targeted the conversation naturally goes longer. Contrary to discovery calls, where the winning “talk-to-listen ratio” is 46:54, the winning talk-to-listen ratio for a successful demo call is 65:35. 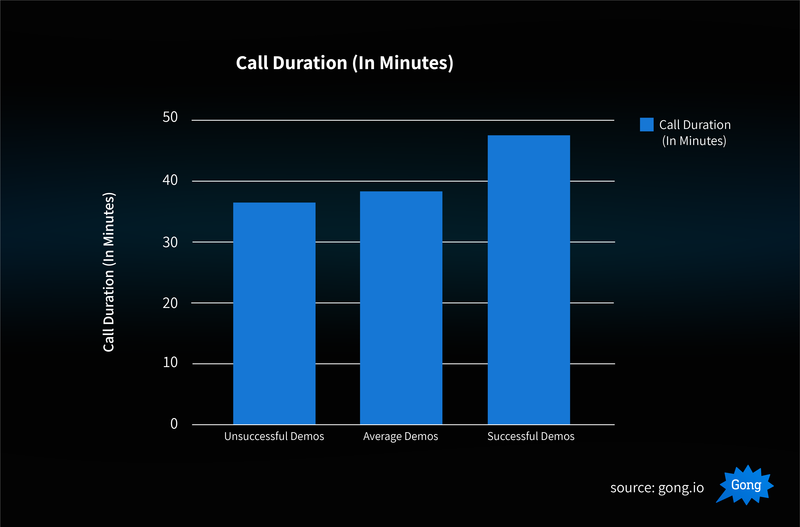 Unfortunately, the average “talk-to-listen ratio” for unsuccessful demo calls is 66:34. Not enough of a difference to be actionable. But here’s where it gets interesting. While the total talk-to-listen ratio during a demo seems to be consistent among successful and unsuccessful demos alike, the interaction patterns that make up the talk-to-listen ratio are wildly different. While unsuccessful demos still achieve a reasonable talk-to-listen ratio, they tend to have long, uninterrupted pitches that can last up to 106 seconds. Successful demos are still “rep heavy” in terms of who’s speaking the most, but they involve shorter “bursts” of pitches that frequently start and stop, allowing the customer to chime in. Our analysis didn’t find a single demo leading to a closed deal that involved more than 76 seconds of interrupted pitching. With unsuccessful demos, long stretches of uninterrupted pitching were common. As a result of this pattern, successful demos have 21% more “speaker switches” per minute, signaling there is much more back-and-forth dialogue taking place than outright pitching. The takeaway: Deliver your pitch in short sprints, not long marathons. What surfaced during the latter part of our analysis (which involved some qualitative analysis alongside just the quantitative) were four “acts” or “phases” successful demos tend to consistently follow. Demo calls that lead to closed deals set the context before jumping into the product demonstration. 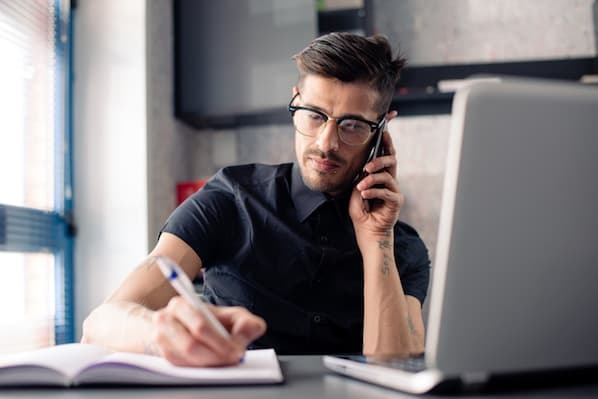 The topics that arose most frequently during the first 10 minutes of successful demo calls were context-building topics: Industry problems, narratives, and overviews. 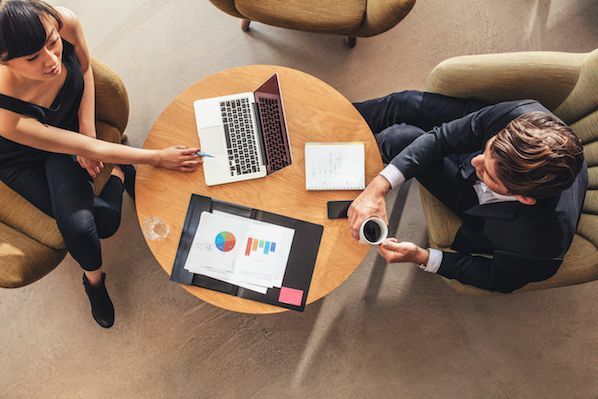 After the initial small talk and greetings of the web conference, account executives who conduct compelling demos prime the prospect with a “contextual overview,” usually lasting less than two minutes. They give the prospect the needed knowledge and context for the demo itself to A) make sense and B) resonate. The best way to do this is by telling the story of the problem you solve, or the narrative that caused your company to come into existence. Demonstrating a product and its benefits without the required context in place will give the impression that you have a solution in search of a problem. The research revealed that successful demos are most commonly conducted in an “upside down pyramid” manner. They start with the conclusion, rather than end with it. Instead of building up to the most valuable part of your demo (“saving the best for last”), winning demos begin with the most valuable part. The data agrees with Peter. In the analysis, a common pattern was that successful demos started by presenting the use case that was talked about the most by the customer during the discovery phase of the sales cycle. In other words, if a customer spent seven minutes talking about coaching, four minutes talking about onboarding, and five minutes talking about pipeline management during the prior discovery call, the demo should begin by immediately addressing the coaching use case, instead of saving that for the end (which is all-too common in SaaS demos). Remember earlier when we talked about speaker switches per minute? A strong sign that a demo is going well: The rate of back-and-forth discussion gradually accelerates as the call progresses. In other words, effective demos begin as a pitch and slowly evolve into a strong back-and-forth dialogue. In successful sales demos, the average “speaker switches per minute” increases by 36% during the second half of the call. If I draw on my own experience and observations, this is when you’ve educated the customer enough for them to engage you in a strong dialogue. They have questions. They have objections. Their heads are spinning with possibilities. The conversation has shifted from a presentation to a robust dialogue between two people working through tangible issues and logistics. At the end of a deal-closing demo, “pricing” comes up between the 38 and 46-minute mark. During unsuccessful demos, on the other hand, there isn’t a clear time window. You may not be explaining your pricing model in simple terms. When the customer can’t immediately understand price, it takes longer to discuss. If it takes you more than a minute or two to explain your pricing to a customer, clarify your pricing explanation. Finally, winning demos involve 12.7% more time -- or roughly four minutes -- on next steps. This leaves plenty of time for the sales rep and the customer to hash out the logistics involved in moving the project forward. I see the opposite all the time. Reps who consistently struggle with converting deals to the next stage simply run out of time at the end of the call. It’s better to make your pitch slightly shorter, ensuring you have plenty of time to work through what a next step looks like in a calm, unrushed manner. Giving a demo without reserving time to plan next steps makes you a 1-to-1 marketer, not a professional salesperson. Well folks, that was a long one. That’s all the data I have for now. Editor's note: This post originally appeared on Gong.io and is republished here with permission.